Happy Village, 1057-59 N. Wolcott Ave. The Happy Village tavern would become a restaurant under new owners. They're requesting a member vote Monday that would consent to lifting a liquor license moratorium at 1057-59 N. Wolcott. The license freeze now blocks any new operator from taking over. The outcome is not binding on 2nd Ward Ald. Brian Hopkins, who would be making a recommendation to the City Council. Cheryln Pilch plans to sell the Happy Village tavern business. She joined the prospective purchasers, Andrew Miller and Addison Thom, in making a July 16 presentation to the EVA board. A previous sale proposal in 2016 was withdrawn. The new prospective purchasers, Andrew Miller and Addison Thom, say they will restore the bar's kitchen and introduce chef-driven casual American fare. The renovations include reducing the size of the patio by adding a glass enclosure. This solarium type structure would take up about half the patio. There are no other sites zoned for a tavern in the moratorium district, says Dimitrios G. Christopoulos, attorney for the buyers. The district runs from Division Street along Wolcott Avenue to Augusta Boulevard. Miller and Thom plan to invest about $3 million in the business, real estate and renovations. To renovate the interior, the purchasers have retained an experienced architect and an experienced interior designer. Miller and Thom will restore the exterior to its original landmark status and historical architecture. Happy Village will have table service and servers for patrons. The purchasers will improve and modernize kitchen ventilation systems. The interior and patio will have dining tables and conceptually will seek neighborhood diners. Other interior improvements include refacing the bar counter. The purchasers will not use the building to the south as part of the tavern. 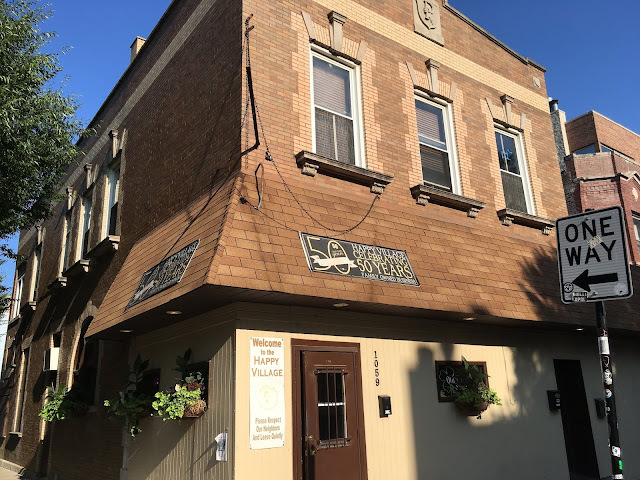 The purchasers will meet with EVA when there are plans regarding the building, which is not controlled in the East Village Landmark District as a contributing building. All servers and hosts will be get Beverage Alcohol Sellers and Servers Education and Training (BASSET) certification. Improved exterior lighting and surveillance cameras. Attendance at EVA and CAPS meetings. Reasonable efforts to maintain the current, limited food and beverage delivery schedule. No emptying of trash at night, only after 8am the next morning. The vote is scheduled for 7pm Aug. 6 at the tavern, which is EVA's longtime meeting place.